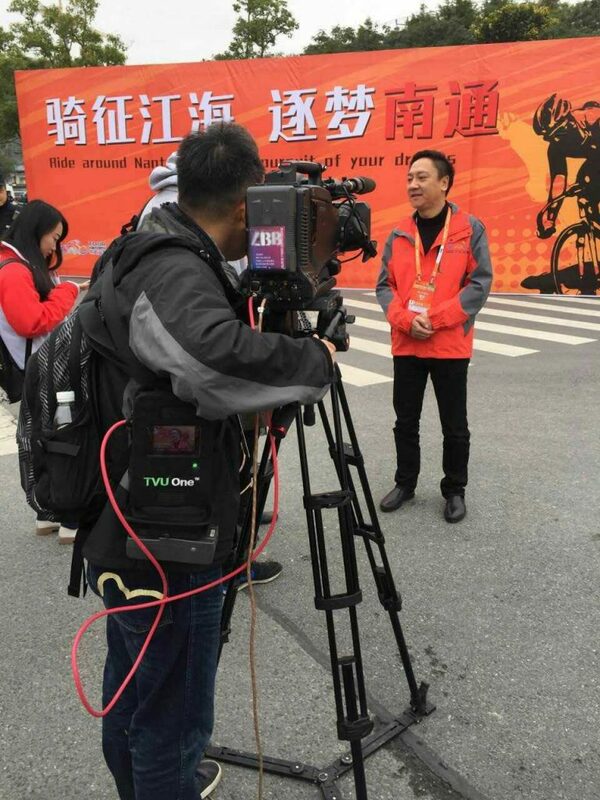 MOUNTAIN VIEW, CA – November 17, 2016 – TVU Networks IP video transmission solutions were used by one of China’s largest media organizations, Shanghai Media Group (SMG), to successfully deliver live video coverage of the 2016 Tour of Taihu Lake Cycling Race in severe weather conditions. The Tour of Taihu Lake is a staged cycling race (several races ridden consecutively) held in the Jiangsu Province of China. In 2010, the first edition of the race was just one stage and one day. Six years later, the race has grown tremendously both in global popularity and length of the competition. For many teams, the highly-anticipated Tour of Taihu is the final race of the 2016 season. For exclusive pre-race interviews and coverage of all seven stages of the race, SMG deployed multiple ultra-compact TVU One portable transmitters from various locations throughout the race. TVU One was used extensively to cover the competition and capture and deliver live HD video footage in real-time, delivering broadcast picture quality despite changing bandwidth limitations. On the second day of the race, a dense fog severely limited visibility, preventing helicopter-supported microwave transmission, and TVU One was relied upon for the entire day’s live coverage. “TVU One played a crucial role in this coverage, particularly when dense fog prevented the helicopter – which was used as microwave relay – from taking off. TVU One was able to fulfill all the video transmission needs as well as meet the stable and superior picture quality demanded by SMG.” Said Mr. Ling Chen, SMG Business Director. “We are very excited to add SMG as a customer and are honored that they selected TVU to assist them with their coverage of the Tour of Taihu Lake race. SMG is a media powerhouse, and we are looking forward to working with SMG on their live video broadcast and technology needs,” said Paul Shen, CEO, TVU Networks. Through its simple one-button operation and ability to simultaneously transmit over multiple combinations of cellular, WiFi, microwave and satellite links, TVU One enables broadcasters to deliver live HD video from practically any location. TVU One also offers broadcasters TVU’s proprietary Inverse StatMux Plus (IS+) transmission protocol to ensure enhanced resilience and superior picture quality in fluctuating bandwidth conditions, as well as the ability to transmit HD video with sub-second latency.